In search of the fresh design ideas to decorate the apartment, professionals sometimes resort to bold and unobvious solutions. 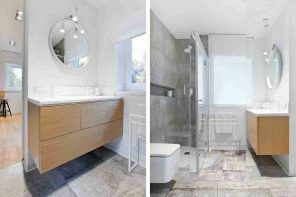 We have gathered a real examples of using musical decorative elements or whole design patterns in different rooms of condos and apartments to show you how organic it may look igniting the creative and amused spirits. 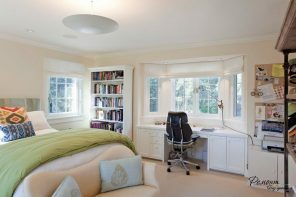 We hope these original interior musical design ideas can excite your imagination nad fill your household with absolutely unrepeatable pieces of artistic atmosphere. The most easy and widespread way to decorate your living room with the fireplace is to male a print at the accent wall above the mantelshelf of the musical instrument or notes. At the example below we can see how drastically such print can change the overall perception of the living. 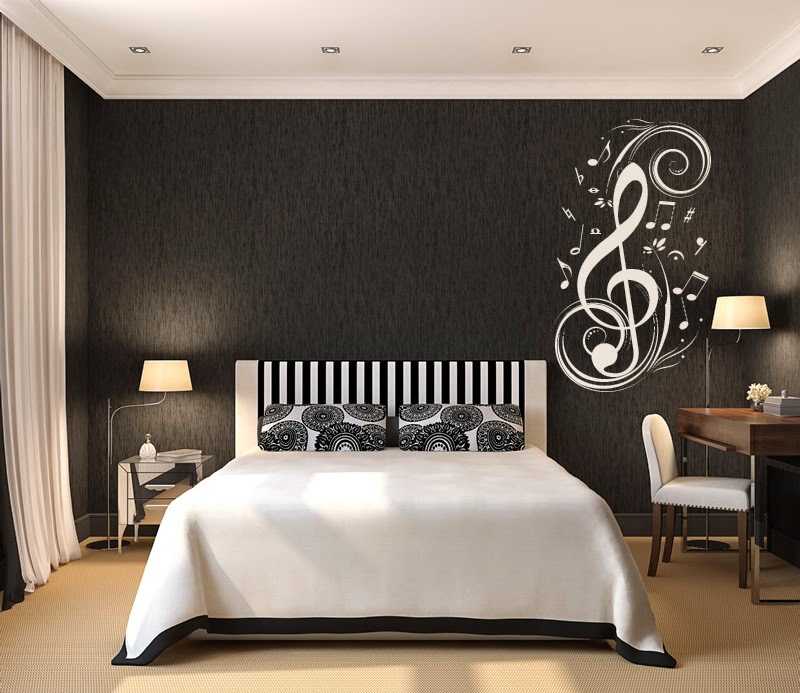 The use of musical instruments and musical theme to ornate the headboard zone is also very effective. But here we can see a real composition of musical instruments, including plate of Ramones at wall, stage illuminators and even linens depicting electric guitar. Kids’ room also deserves to be arranged with artistic taste. The musical notation decorating of the walls can arouse interest of your child and encourage him or her to play music. And such unique symbiosis of modern hi-tech apartment with musical theme probably will leave no one indifferent. This masterpiece of design art is a real godsend for a person addicted to music. This interior can arise sympathy or aversion (everything depends on personal preferences), but it definitely will not leave you without emotion. Glowing music plate with the silhouette of big city on the accent wall is a very symbolizing and dynamic element of the interior. 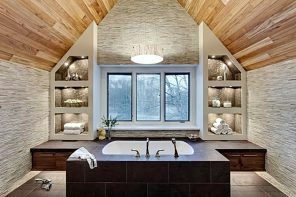 It can emphasize the utmost creativity of the homeowners and their striving to be in step with the times and fashion. And in contrast to the photo higher, we got to the classical interior, yet with bright red wall paint and curtains it doesn’t creates en impression of fully conservative place or just museum of musical instruments. Not every room full of instruments can have spectacular look and can be possibly cluttered and overloaded. Make sure, all design elements are in logical and color liaison with one another. Contemporary style can also boast with originality and modern approach to the designing of striking interiors. Absolutely unique “chandelier” built of rock guitars gives the unique shadow and charm to all the place and organically echoes with glass round table with drumsticks set under the surface. Vintage with touch of English classic style can also be effectively decorated with the help of musical instruments and accessories. Just take a look how easily this nice living for poetry readings became a really full-fledged musical studio. Sometimes your apartment can resemble the restaurant decorated for wedding. But if you are creative nature and you don’t mind of country wedding photo location to be in one of your rooms, this design idea can be your savior. 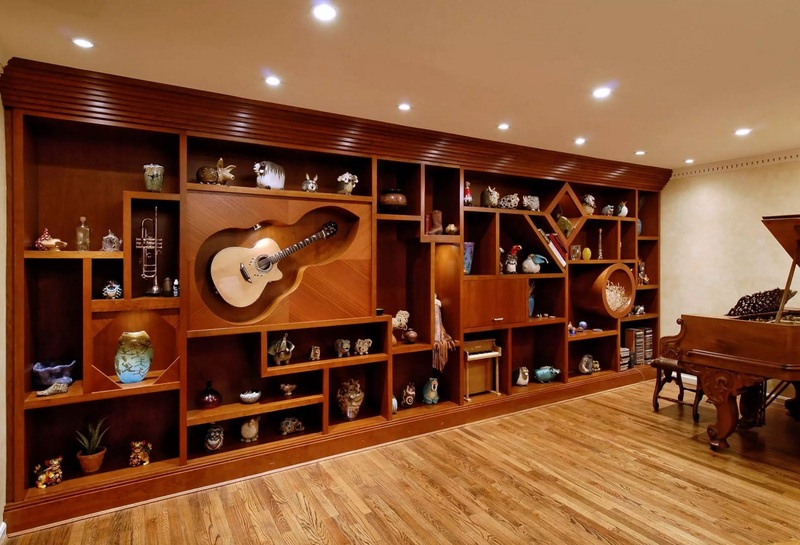 Not only musical instruments can provide the logical foundation of setting the room atmosphere. Here we can see the really unique black wall and ceiling painting giving you ability to write right on them without distracting from creative process. And what if designers of the furniture go further and want to give you the ability to keep your instruments right in the wall unit? We receive such unusual but spectacular design solutions for classic interior. Staircase will emit positive energy, dynamism and airiness by adding musical pattern to its decoration. Just look at these jazz performers as if running up the stairs pleasing our hearing with improvised melodies. You can also tap the musical themed paintings or a whole installations to rise up the overall degree of creativeness. It is better option for such design styles as hi-tech, contemporary, fusion, or some classic styles.